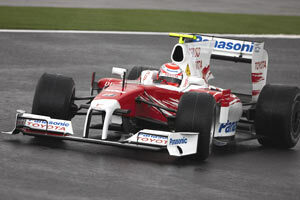 Panasonic Toyota Racing introduced their 2009 challenger, the TF109, on January 15 at their home base in Cologne. The car is a work that started in October 2007 and the team's aim is again high. Chairman and Team Principal Tadashi Yamashina states: "Our target this year is to fight to win the first race for Toyota in Formula 1." It is obviously a departure from its predecessor because of striking changes in the technical regulations. As a result, previous spoon shaped front wings, angel wings and chimneys are gone, in favour or a lower and wider front wing and cleaner sidepods.